Saturday, October 25th, 9am the public is invited to join Volcan Mountain Foundation (VMF) interpretive volunteers and docents at VMF's Volcan Mountain Nature Center (22850 Volcan Road, Julian, CA 92036) to learn more about Native American Literature through an ancestral perspective. Presenter Dr. Theresa Gregor is a descendent from the Iipay Nation of Santa Ysabel, where she grew up, and has spent most of her life. She has a Ph.D. in Native American Literature, is an instructor at Cal State San Marcos, and is the Executive Director of the Inter Tribal Long Term Recovery Foundation. A tour of the Nature Center’s new Watershed Trail led by VMF Education Coordinator, Kathleen Beck, will follow Dr. Gregor’s Native American Literature presentation. 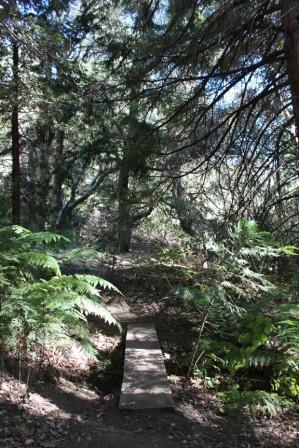 The ¾ mile trail meanders through a lush mixed-conifer forest of fir, pine, cedar, and oak, and explores the riparian zone around the headwaters of Santa Ysabel Creek. Interested participants are invited and encouraged to learn more about becoming an interpretive docent for VMF’s Volcan Mountain Nature Center. Due to gated entry, please RSVP to participate in the 2 in 1 presentation and tour by Thursday, October 24th, by contacting VMF Education Coordinator Kathleen Beck at 760-518-3273 or VMFEducation@VolcanMt.org. 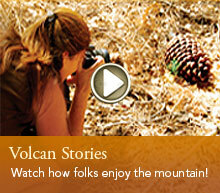 Visit the Volcan Mountain Foundation's website at www.VolcanMt.org for ongoing updates of events and activities on and around Volcan Mountain.